Damn Trylo that is a big missile. I'm giddy just thinking about the Fang, looks fantastic by the way. Edit: Fang is great! Working as intended by the looks of things. I'll set up a carrier fleet and do some more extensive testing. Rattlesnake/Komodo MKII feel like much more viable options now too. Caused by: java.lang.ClassNotFoundException: Compiling unit "data/scripts/plugins/TheNomadsRetributionWeaponPlugin.java"
I had this error too, for me it was caused by Shadowyards' own data/scripts/misc/Utils.java not having get_distance_squared (or get_distance). Copying the larger Nomads one over to Shadowyards fixed it, but the underlying problem is the namespace overrun. 1. The CR cost per fighter is totally out of whack, due to the way the deployment costs are applied even if NONE of them die they're still out of action for days. I'd say if you gave them roughly the cost of a Dagger they'd be closer to the mark but it's hard to say. The downtime is definitely a killer though. 2. This ties into the CR cost - The total combat effect of a wing of Fangs is... really low, at best you're going to get 5 total missiles which may or may not do damage. The missiles themselves seem quite violent -Out of curiosity what IS the listed damage?- but not so violent as to justify how few are fired. 3. The Bomber AI doesn't actually suit the Fang, the formation based bombing run is totally meaningless and actually has the unfortunate side-effect of sometimes leaving the carcass of the ship ontop of the intended target which means it often dies before the missile is fired due to collision damage. 4. Hilariously they can't perform their intended roll in a 1-sided fight, I'm not sure it's a problem per say but it's not uncommon for them to fly about ships un-targeted and doing very little if any damage. It's a huge shift from a standard bomber which ideally exploits an overload or high flux caused by supporting ships to do its damage which isn't necessarily a bad thing but it definitely lowers their overall value. The Flycatcher's primary competition for Destroyer carriers is the Gemini... I'll be the first person to point out that the Gemini is probably overpowered for its cost of 2 supplies/day but I just can NOT justify ever deploying a Flycatcher. 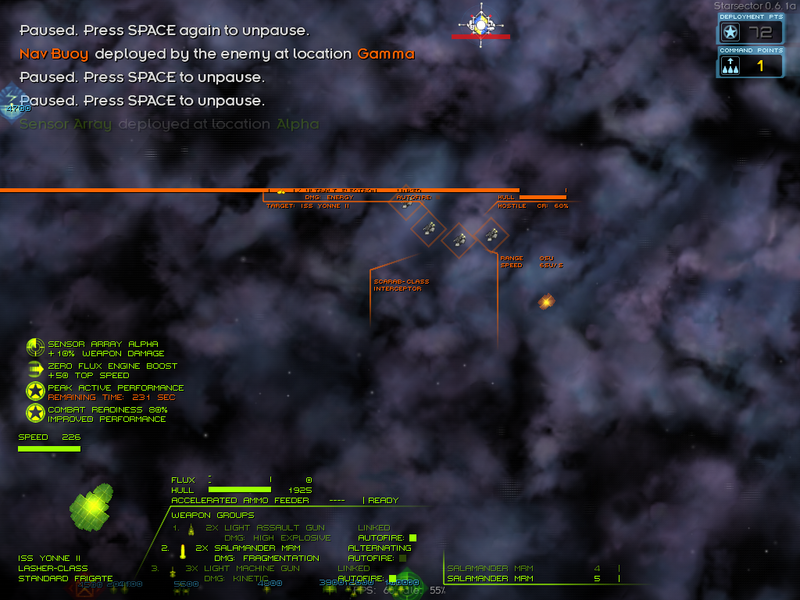 But, on the other hand, I't possible that nomads carriers are less efficient than the mid-line Gemini. Negative flux lol I want to see a -200% damage multiplier applied to their beam weapons! This will be fixed shortly, I'm going to move my Utils into a deeper namespace to avoid conflicts like this. images: "geckos not firing" & "negative scarab flux"
theSONY, I think it's possible that the version of the Nomads that is bundled with UsSJ had a problem with both the gecko and scarab, related to flux; I'll check on this and get back to you, but if it's what I'm thinking of, it's already been fixed. EDIT: I have confirmed this, this issue was already fixed, when Uomoz next integrates Nomads it will be included. 'Til then, there's not much to do about it. Thanks as always Borgoid for the superb feedback. I'll consider each item and how best I feel it can be addressed in a release SoonTM. The listed damage per missile is 3250, of energy type. Balance tweaks, small misc. fixes. Exerelin compatibility updates. Portraits/icons. Weapons tweaks. Small stuff, but good stuff. OH! I almost forgot: I added a pant-load of missions, and they're huge. If you have a decent computer, crank your battle size up to 500 (it's in settings, in-game) and play one of the big missions. It's 1000+ total fleet points, or thereabouts. Great fun. Also if you're in Dev mode and you go through the Nomads track on the character creation process, when you start the campaign you'll have a full Nomads fleet. Great for testing with. Have fun y'all. OK Folks. Big release coming up. 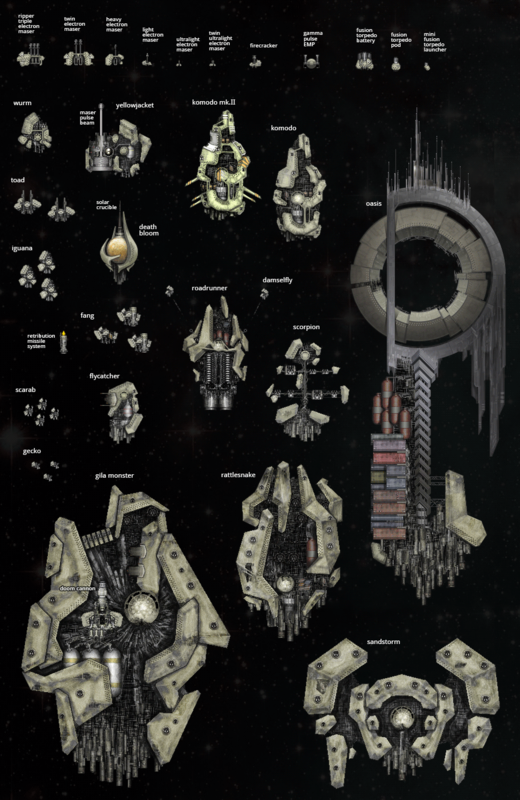 After this next release, Nomads will officially be version 1.0, and development will slow for a while as I work on other Starsector projects, such as the ship editor, and the Star Control II mod. So, it had to be something suitably awesome, to capstone this whole faction. The Roadrunner: It's equipped with unmatched speed (for a destroyer), but it pays a hefty price for all that horsepower. It makes every conceivable tradeoff in order to cram a cruiser-sized engine into a destroyer chassis, and the engine is from three generations of ship technologies past, but it's effective. The Roadrunner can catch damn-near anything. When it does catch up to its target, it can bring to bear a pair of Gamma Pulse EMP turrets, a new medium turret that dishes out a hefty amount of EMP damage (and some regular energy damage as well), which is ideal for disabling engines. It is also worth mentioning that it can deploy a pair of Damselfly tug drones (2x) that can provide a passive speed boost as well, but the speed boost is lost if they are destroyed (of course). The ship is currently playable but is undergoing a few rounds of balance testing etc, and I'm also working on the visual effects for the visual drone tow line, and the effect I'm calling the "V24 Thunderdome Musclecar Engine FX" which animates the piston-like structures on the beastlike engine, varying the animation speed according to the ship's speed. Clever... Very cool too! 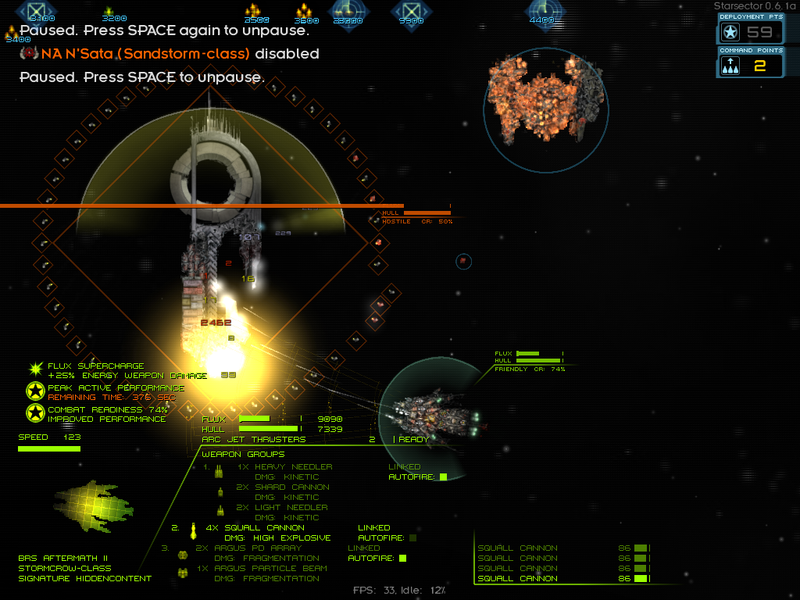 Starsector needs more EMP weapons, which I plan on adding in my own mod. The roadrunner is by far one of the most interesting ships ever modded into the game. It is definitely powerful (maybe, considered its peak speed, a peak active timer could be appropriate like for the medusa), but the mind blowing stuff is the cosmetics you added onto it. Simply amazing. The engine motion and the tug-drones are something never ever seen before around here. I tried to balance the speed against the hull/armor strength (it's pretty weak), the reduced-efficacy shields (compared with all other nomad ships) and the very limited flux dissipation, leading to a very shortened effectiving firing duration; leading to the most effective tactic being a sort of "fly-by" which is really fun to pilot.